Hundreds of gray wolves could be slaughtered in Wisconsin starting this October and lasting until the end of February. “In short, although this act claims to address depredations, the proposed rules for the hunt suggest that recreation or revenge is the goal,” Treves said in a letter to the board. Treves also said night-time hunting and the long season treat wolves without the respect due a trophy animal. 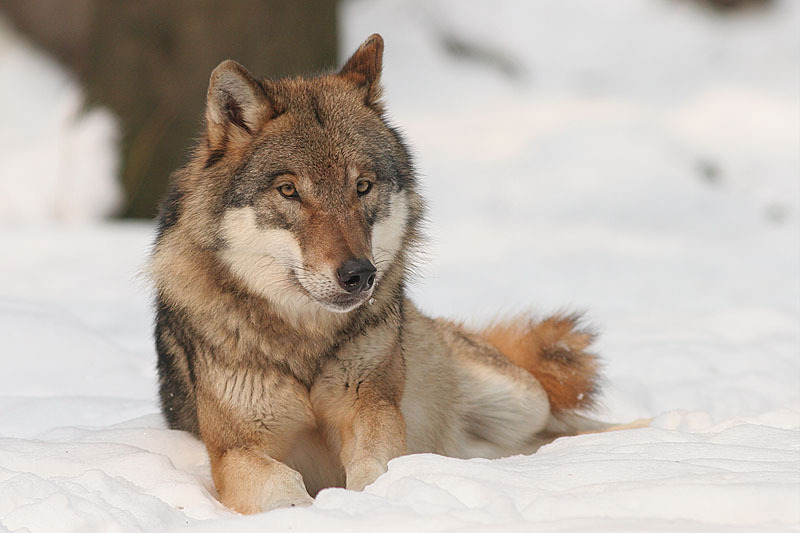 Treves warned that this extreme plan will likely trigger lawsuits and could put the gray wolf back on the endangered species list. Walker is a total idiot. I hope he gets recalled on June 5. It is a very sad period in WI when the National Resource Board totally overlooks public opinion, science, moral standards, ethics and any sense of empathy to living creatures to pass the wolf kill bill. This makes me feel a sense of hopeless & helplessness toward our future. It makes me afraid our society is becoming more & more cruel with little hope of things getting better. And it will get even worse if Herr Walker survives the recall. This state is completely out of control and we have crossed lines that should never have been crossed. The arrogant thugs that are running this state really think that they are some kind of “trailblazers” with their radical kill everything agenda. They should be ashamed of themselves. What will they kill when all of the wildlife is gone? I guess us “liberals” are next. You can’t call it a “hunt”. The wolf is never hunted, it is only killed out of fear and hate. I’m a deer hunter, but I will never kill a wolf or coyote. A true hunter respects what they kill and eats all the meat and uses as many of the parts as possible. People very rarely use any part of the wolf when they kill them, many don’t even bother finding the body and confirming they’re dead. The animal could lay there, in severe pain, for days before they die. It’s a fucked up world we live in. All these “wolf management plans” are not remotely based on science, it’s all political. As Adrian Treves said, no one will hunt the wolf, they will only kill them out of hate or revenge. To the douche they interviewed who said ““I can just see the wolf pups getting older and looking at my livestock on the other side of the fence. There is an absolute need for controlling the wolf population in this state,” have you ever tried a 10 foot chain link fence? I’ve never seen a wolf jump over a chain link fence. don’t blame the wolf or coyote for your laziness and neglect. Alice, killing for food is one thing but killing because fear and hate is appalling. Inhuman treatment, barbaric traps, sport of hunting down and killing something that gives nature a boost in keeping the ecosystem on a healthy track …. There are ways to control without killing them, it is called spaying the females who are not first and second in line for Alpha. I will not be consuming any cheese or other products from Wisconsin and feel you should redeem yourselves before this state finds itself with its wildlife population declining due to sickness, lands going to hell from lazy herds …. You could take a lesson from from people who care for wolves as Alice Fedor has stated. You never hear that they escape the compounds …. Lazy and negligent, needless slaughter!!! rali, even if Barrett wins , what do think will happen with the hunt? Did you see what happened to Linda Comac and fb? I don’t understand it. I saw what happened on Facebook. The gratuitous animal killing pages are fine, but a pro-wolf page gets banned? Something is very wrong with that. I think that the only way to stop the upcoming wolf slaughter is for someone to sue and a court order blocking it. The minute this bill passed the feds should have stepped in and told Wisconsin that the bill was far too extreme and it could put them back on the list. I would not be surprised if the Great Lakes wolves are not back on the list in the next couple of years. These sadists just cannot help themselves and will try to kill as many as possible. The first step is getting Walker out of office. I am not so sure that will happen in the recall. Of course I would also not be surprised to see him indicted in that John Doe investigation even if he wins. You don’t give immunity to that many people if you are not going for the big fish. Barrett was just on MSNBC tonight sucking up to hunters, so I don’t know what he will do. Anything is better than that “divide and conquer” thug in office now. Why did we fight to save them if people where going to kill them when their population was rebuilt? Because many of these so called “sportsmen” just cannot stand to see those of us who care about wildlife having any kind of success. Many are like overgrown children who set out to destroy what makes others happy and they are encouraged to do so by the hunter/trapper ran fish and game departments. I saw Barrett on Ed Schultz- wasn’t too happy – of course, now he may say anything. “We can only hope that lawsuits will be filed to challenge this insane plan, and that the federal government steps in and re-lists the wolf” (taken from the last paragraph). There is more you can do then ‘only hope’, however, most will just let others do the work of llawsuits and funding them; the rest of us will just sit at the computer and complain to ourselves. Provide legal & technical support to grassroots groups that are working for the environment. They tend to work with water issues-have done some Pro Bono work. Have been impressed with them in the past. I was attempting to direct you with my poor web address to a Milwaukee Journal Sentinel online outdoor editor Paul Smith 5/23/2012 who quoted Jodi Habush Sinykin Sr. Council @ Midwest Environmental Advocates as saying “Haste makes Waste. The rushed rule making process comes off a financially & ethically irresponsible. Lawmakers had failed to work with wolf experts including current & former DNR employees & researchers @ UW WI when legislation was passed.” It appears as though Midwest Environmental deals with other issues besides water. If I remember correctly Jodi was speaking as a private citizen and not on behalf of Midwest Environmental Advocates. As an upstart group we just do not have the funding to hire a lawyer to challenge this insane bill right now. However, we would certainly be open to having a legal firm do pro-bono work to challenge this thing under the public trust doctrine. The inclusion of dog packs should be enough to have this thing challenged and the bill thrown out. Not to mention the fact that the bill was written by the Wisconsin Bear Hunters Association and their seven lawyers with ZERO input from the DNR wolf experts. It’s also funny how all of the anti-wolf groups like THE NRA, SCI, Wisconsin Wildlife Federation, and the bear hounders knew about the “public hearing” almost a week before it was announced to the public. The citizens only had 24 hours notice. I wonder who this Wisconsin Bear Hunters Association is funded by… Not sure, but I don’t think that they receive pro-bono work from layers. I don’t think that they are a state funded group either -which means that there money comes from private citizens like you and me. I think that if this matter is as important to those of us who oppose this hunt (as it is to this bear hunters group that support it), then we would put equal effort towards a ban, both monitarly, and in time and resource. I agree 100%. The one thing that the hunting groups destroy us with is through their organization and fundraising. We need to get coordination among the many pro-wildlife groups out there but no one is stepping up. We are trying, but it has proven very difficult. Everyone has their own agenda with no view of the bigger picture. Our wildlife has pretty much been abandoned by the major animal welfare groups. They had all of the money and lawyers in the world when fighting the delisting and now it appears that they have surrendered and given in to the killers. The grassroots pro-wildlife groups mean well, but they seem to have this illusion that only internet petitions and bitching online will help our cause. The hunting groups are deeply entrenched in our legislature as we found out all too well when we went to the state capitol in Madison to fight the wolf kill bill in February. We were pretty much blown off and our efforts made no difference at all. $$$$ talks with these people and we need to start fundraising to get the lobbying and legal services that the hunters and trappers have on-demand. If anyone is willing to help us get this fundraising moving forward, we are open to any and all suggestions from living wildlife advocates. We can be a very powerful force if all of the grassroots work together rather than it being vegetarians vs vegans or cats vs dogs. ALL wildlife is precious and we need to remember that is who we are really fighting for. This is not a wolf hunt; it is a wolf extermination hunt based on the cruelest and most inhumane methods ever devised. The only thing missing is aerial gunning! Give them time, I am sure aerial gunning will be next. The sneaky underhanded way that this thing became law is shameful. I expect this kind of garbage from the GOP but I was horrified at the number of Republican-lite Democrats who voted for it. How can anyone in their right mind think that allowing hounding, night hunting, and the other garbage in this plan is okay? What the hounders do not realize is that this bill is shining light on their activities. Most of these sadists flew under the radar but now their actions are out there for all of us to see. Just wait until the first video emerges of a pack of hounds attacking a wolf.